Blenders are a mainstay in bar setups. 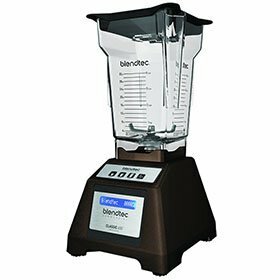 Blendtec is considered the household brand within the bar industry for blenders. If you are looking for a low-key blender check out the EZ Bar Blender. It comfortably blends 10 to 30 drinks a day. It's slender design is an added bonus to limited counter space. The EZ series boasts a powerful 1600w 13A direct-drive motor and easy-to-use preset blending modes. You can keep track of the blend cycle with a blue LCD screen allows you to keep track of the blending cycle. The EZ Bar Blender also has 4 programmable touch buttons. The package includes 1 - 64 oz. container with lids. All Blendtec products are dishwasher safe and has a lifetime warranty on the blade and coupling.